On February 21, the community will come together once again to say no to domestic violence and sexual abuse with the 2nd Annual Illuminate Austin event. 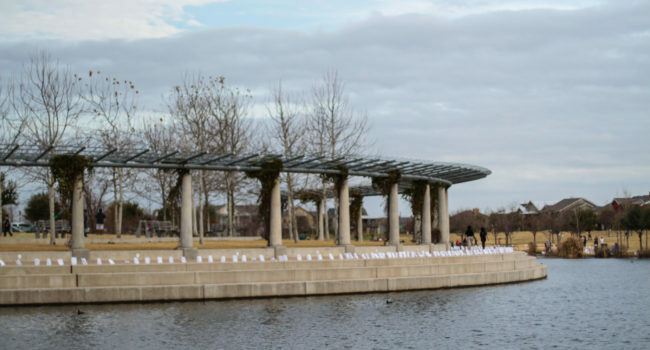 Mueller Lake Park will be lined with luminarias decorated in memory of those lost to domestic violence and in honor of those who survived while community members come together to support them in a walk to end violence. We are bringing domestic violence and sexual abuse to the light. We are walking in support; we are walking in remembrance; and we are walking to say ‘no more’. The more time we spend talking about the violence and abuse, the safer it gets to report. The shame and guilt that come along with assault in our culture makes it hard for survivors to speak out, but when we stand in solidarity, we show a united front against violence that survivors can count on. Each conversation we have about violence becomes a part of a larger conversation, leading to a culture more supportive of violence survivors and more receptive of reports. Last year, our goal was to get 500 Austinites to the walk and we ended up with over 1000; this year, we are hoping to make that conversation even bigger. Sign up with a team or an individual; it’s free to join, but donations are encouraged! The walk raises essential funds for SafePlace programs, but also helps deliver a message that help is available to the thousands of homes in our city where violence and fear still prevail. Come out to the 2nd Annual Illuminate Austin and join the conversation! To learn more about this event, visit the Illuminate Austin website.